This table is awesome. The glass top makes it really easy to clean and keep sanitary. 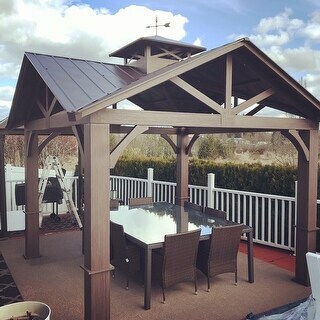 The color is more of a grey than a brown but it coordinates well with the brown espresso chairs I purchased. Make sure you know where it's going because it's a monster to move. 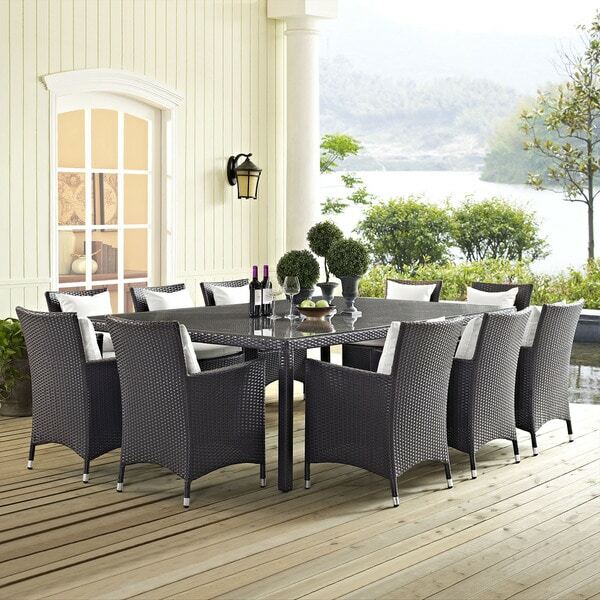 Leave a positive impression on friends and family while enhancing your patio, backyard or poolside repast with this patio and dining table set. Havenside Home is a versatile outdoor collection that combines according to the spontaneous needs of the moment. Signature required on delivery. This item will be delivered to the nearest entrance of your home. Note: Fees may apply for additional delivery services. HUGE table - perfect for large families and for parties. One note of warning - the glass is EXTREMELY heavy and you will need a small army to take it to where you need it. If I would do it again - I would have purchased installation. Love this table & chairs, great for large family. This table is really nice, big ,and beautiful. 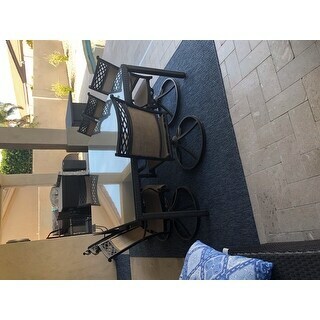 It has space for 8 chairs.nice for outdoor. Great table with substantial glass top. We have not opened this yet because I bought these at the end of season for a pool that is still being built. While I haven’t seen it yet, I am excited to have found a table that seats ten. Huge and sturdy! This is a massive table. Is comfortably seats 8. When it arrived 2 of the legs were missing the wicker covering on the last couple inches of the legs. I contacted Overstock and they were able to send out 2 replacement legs - great customer service! Unfortunately, the glass top is incredibly heavy. So we have not switched out the legs yet - it will be a lot of work ;o) My only complaint about this table is the actual color of the wicker - it's more of a muted brown, not espresso brown. Compared to all of our other patio furniture, this table is a little lighter in color. For the price it's an amazing deal! This is a great piece. Good value. This table is terrible!!!! Fell apart in 2 months. 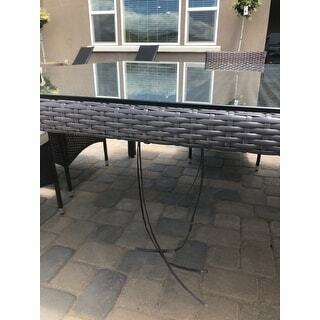 Do not buy this table!! "Do you sell any chairs that match this table? Would these match? 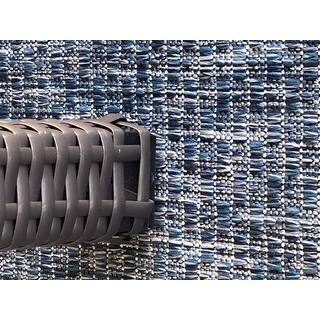 Safavieh Hamptons Bay Wicker Stackable Outdoor Chairs (Set of 2) Item Number - 12989785 (There was no color specified on the chairs that I could see - so I don't know if they're "Espresso" or not." 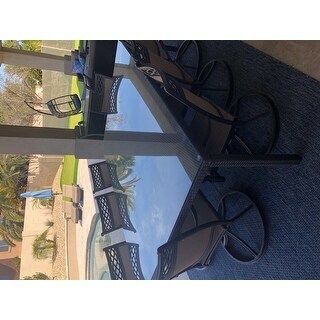 "What color is the table and can you send me the link to the chairs to this table thank you"
The table is a dark brown as you see in the pictures. Unfortunately the chairs are not available at this time. "Does this,set come with 10 chairs and cushions included with the table as well ? Thx"
This is the listing for the table only. "do the chairs come with the table? If so, cushion as well"
No, this is the table only. Unfortunately the chairs are not available. "Do the chair cushions come with the Gather 90" outdoor patio dining table set?" "Is this table color Grey or brown? "